In July 2018, Jason Myers joined the Appetite’s Executive Team as our first Non-Executive Director. In this article, we look back at a selection of the many roles he has held during his extensive years of experience in hospitality (the only industry that he has worked and invested in) and what he brings to The Appetite 4 Group. Jason Myers first entered the hospitality industry as a bottle boy, working his way up to bar back, then KP, chef, and bar man. At the age of 27, Myers became a Board Director and he later went on to become a CEO, founder, owner and chairman. Jason is the founder and leader of “Splendid Management” and “Above & Beyond Limited”, both of which he set up to invest and grow hospitality businesses and provide consultancy services to other leaders in the sector. Jason also set up two hospitality investment funds – Grosvenor Pubs Limited 1, an EIS based fund set up to invest in quality freehold country pubs and Grosvenor Pubs Limited 2, a non-EIS property-based fund that buys small boutique hotels and country pubs. Some of his other high-profile industry involvements include “Soul Foods” (another EIS project), a modern American-themed fun bar with a party atmosphere. When Jason was working with the restaurant group it was an EIS based investment fund that had four trade stores in the heart of London and was looking to buy a small group to convert into their own brand. In his last CEO role, Myers led an award-winning restaurant group called “Busaba Eathai”, the UK’s leading casual Thai dining brand. While in his role as CEO at Busaba, the restaurant was named in the “Top 25 of Zolfo Cooper UK’s fastest growing eating and drinking out businesses” and was shortlisted for this year’s “CGA Peach Hero Awards in the Evolutionary Brand category”. Jason is the current board director and share-holder for Village East (Riding House Café) where he helped raise funds to build the latest £2m store in Victoria Nova and provides consultancy and development services to the company’s founder 2 days out of each month. He takes a further 2 days out of every month to perform his duties as the Board Director and shareholder of Big Chef, one of Turkey’s leading casual dining groups. 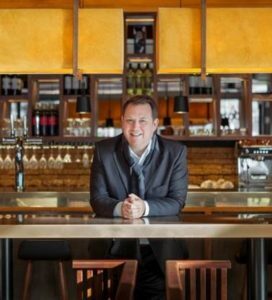 Jason’s duties here include working with board and PE investors and head up Big Chef’s international strategy. Jason’s most recent business venture saw him become the co-Founder and seed investor of Counter foods with David Ramsey. After opening Counter food’s first store, Myers and Ramsey are continuing to work together as partners on investments and advisory roles. They are currently raising £5m investment for a quality independent managed pub business in the South. In the past, Jason has successfully worked in international markets in multiple roles such as Jumeirah Restaurant’s Managing Director and as VP of Jumeirah Hotels F&B worldwide. In fact, he was credited for the strategic creation of Jumeirah’s pioneering stand-alone restaurant group RnB. The businessman also held a director position with several well-known establishments, such as Skylark Group, S&N, Spirit Group, Greene King, Gondola Group and Ignite Group. Jason had previously been a shareholder and board member of My-Check but stepped down from the board when the payment app business grew exponentially and it moved office to Asia, NYC and Israel. With over 25 years of experience in the hospitality industry, Jason has received multiple awards and honours for his work. The businessman has been a guest speaker for Hilton F&B board in 2015 and 2016, Peach and M&C in 2016, with his most recent speech at Propel in 2017. As mentioned earlier, Jason was a CEO at Busaba, which was nominated for “Best Small F&B Business Caterer Awards” in 2016. In the past, Myers was recognised for his extensive work in the hospitality industry in the Middle East. Some of his accolades include being a Government Advisor in Dubai, receiving the “Power No.1 2013/2014 the Caterer Middle East” award and being mentioned in “The Top 20 Most Influential Brits in the Middle East”. Jason starts his role as non-executive director at The Appetite 4 Group with a brief to grow the business in the areas in which it already has considerable experience and in which it enjoys a high reputation for matching the right clients and candidates together. In addition, The Appetite 4 Board has planned a multi-year expansion into more niche areas of hospitality and catering here in the UK with an eye to international expansion in the medium term.